Energy conversion occurs everywhere. Solar panels convert sunlight into electricity, car engines convert chemical energy in gasoline into kinetic energy that accelerates a vehicle, and ATP hydrolysis converts chemical energy in ATP into mechanical energy that feeds your muscles. Thermal energy, like the exhaust from a car or industrial processes, can be converted to useful electrical energy using special materials including thermoelectrics, thermionics, and pyroelectrics. Certain materials have a built-in electric field, called polarization, due to their crystal structure. Polarization will vary with temperature leading to pyroelectricity where electricity is generated by heating or cooling polar crystals. In general, the polarization decreases in response to increasing temperature. Ceramics, polymers, and even biological materials can display pyroelectricity. This effect is commonly used in motion detectors where heat emitted from people triggers the electrical response in the pyroelectric. One exotic material system that exhibits this phenomena are antiferroelectrics where polarization can increase as opposed to decrease with heating. Antiferroelectric ceramic materials are typically used for energy storage applications. In this work, the pyroelectric coefficients of an antiferroelectric lanthanum-doped lead zirconate titanate thin film are measured, and regions, where the pyroelectric coefficient is positive and negative, are established. Modeling and auxiliary experiments show the physical origins of the bi-directional response. Researchers discovered that the positive pyroelectric response in antiferroelectrics comes from the temperature dependence of the electronic properties of the material, not a polarization change with temperature typically associated with pyroelectricity. Energy conversion is accomplished when alternating temperature and voltage profiles act on a pyroelectric capacitor, closely resembling the thermodynamics of an engine (figure 1). Continuing the engine analogy, the voltage across the film is equivalent to the pressure of the gas inside the engine. Since the 1980s, the “pyroelectric-as-an-engine” mindset has driven innovation in this field. The efficiency of this process can be increased by increasing the temperature, pyroelectric property, or the applied voltage. Antiferroelectrics, with their bi-directional pyroelectric coefficient, then provide an interesting way to operate the pyroelectric “engine.” By pairing an antiferroelectric with a regular pyroelectric, they could pass charge back-and-forth while running cycles (figure 2). Since the electric field is equivalent to pressure, this is analogous to a V-8 engine with opposing pistons helping drive one another. Since these devices are capacitors, they will self-resonate when connected with an inductor. The bi-directional pyroelectric coefficient enables energy converter designs not possible with normal pyroelectrics alone. 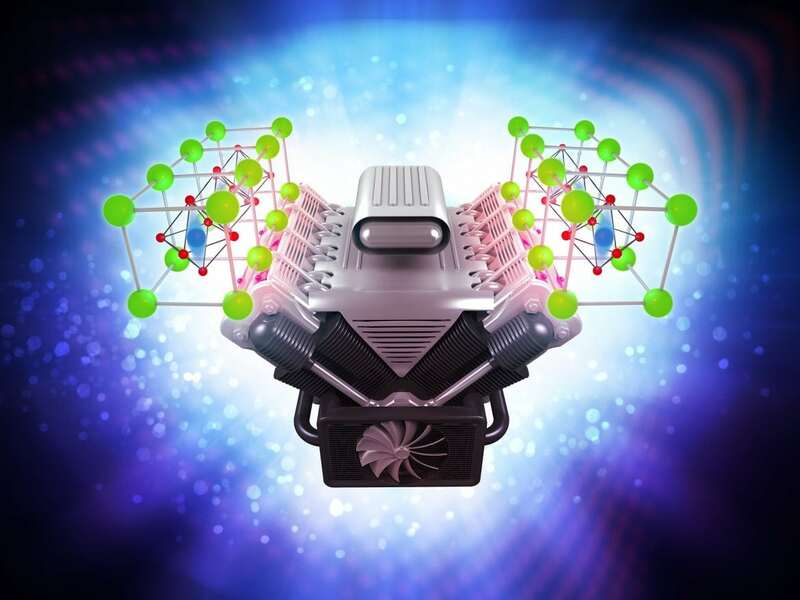 If both conventional and antiferroelectric regimes are realized on a single device, then the two cycles working together enables increased power and efficiency. In this research, the addition of an antiferroelectric increases the power by 30% to a combined density ~ 3 W/cm3. Further work is needed towards realizing practical pyroelectric energy conversion. 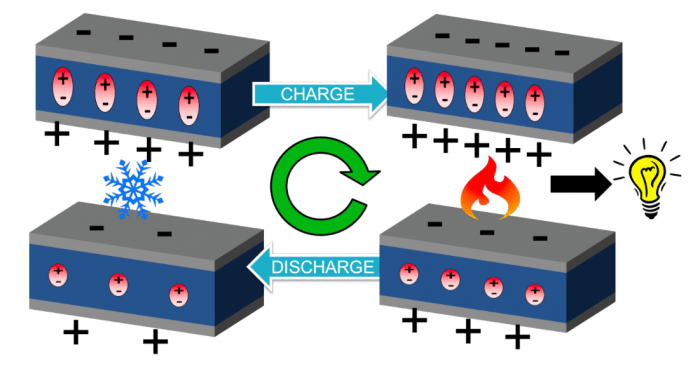 Pyroelectric energy conversion is a very attractive approach to converting low-temperature (< 200 °C) heat exhausted from industrial processes, power generation, and other sources which would otherwise be wasted. It is also being explored by the U.S. Army as a technology for wireless power transfer where the heat source is a laser beamed from kilometers away. Advances in pyroelectric materials and devices could make these energy-saving and power-sharing technologies a reality. These findings are described in the article entitled Combining inverse and conventional pyroelectricity in antiferroelectric thin films for energy conversion, recently published in the Journal of Materials Chemistry C. This work was conducted by a team led by the US Army Research Laboratory including the University of Connecticut, University of Maryland, and the U.S. Naval Academy. Yomery Espinal is a materials engineering researcher at the University of Connecticut | UConn. Dr. Brendan Hanrahan currently serves as the president of the Mid-Atlantic Micro/Nano Alliance, a non-profit dedicated to facilitating regional scientific discussion and collaboration.